A dying woman sat in her kitchen, delivering "motherly exhortations" and her last will and testament to a video camera. The 85-year-old widow glanced across the room at one of her daughters, who stood to inherit a larger share of the estate if the "video will" could alter a written will signed just two days earlier. It is a scenario that might ring alarm bells, and which raises questions about whether a will that is not in writing and witnessed by at least two people is legally valid. Justice Linsday said the woman made a "series of short, and apparently well-considered, disciplined statements of intent (coupled with motherly exhortations in passing) that stand neatly with the will as an alteration of the primary document". He ruled that, in light of the evidence and the absence of any objection from the other siblings, there was "no room for doubt" the will was voluntarily made. He admitted the video as an informal will. But Justice Lindsay sounded a note of caution to others considering delivering a will to camera. The costs of the case and the substantial delay in processing the probate application - Ms Chan died in June 2012 - were the result of legal uncertainty about validity of a video will. Orders for a video will to be admitted to probate pursuant to the Succession Act 2006 NSW, section 8. 2. Declaration, pursuant to section 10(3)(c) of the Act, that the testatrix knew and approved of, and freely and voluntarily made, a disposition in favour of a person who witnessed and assisted the making of the video-will. QLRC Miscellaneous Paper 29 LRC 85, paragraphs 3.33-3.36.
does constitute a “document” as defined by section 3(1) of the Succession Act 2006 for the purpose of section 8 of the Succession Act, by reference to section 21 of the Interpretation Act 1987 NSW, and, as such, may be admitted to probate as an “informal will” under section 8 of the Succession Act: Cassie v Koumans; Estate of Cassie  NSWSC 481 at ; Alan Yazbek v Ghosn Yazbek  NSWSC 594 at -; Mellino v Wnuk  QSC 336; In the Estate of Wilden (Deceased)  SASR 9 at - Cf, Treacy v Edwards; Estate of Edwards (2000) 49 NSWLR 739 at 743 – 746; NSW Law Reform Commission, Report No. 85, Uniform Succession Laws: The Law of Wills (1998), para 3.12. Although, as a matter of jurisdiction, a testamentary statement in the form of a video will satisfies the requirements of section 8, the nature of the informality attending an oral statement of testamentary intentions might, in practice, present an impediment to the Court being satisfied that the requirements of the section have been met (as Cassie v Koumans  NSWSC 481 at - illustrates); the transaction costs of satisfying the Court that those requirements have been met may be an unnecessary burden on the will-maker’s deceased estate (as the present case demonstrates); and the informality of expression that commonly characterises an oral statement may be productive of uncertainty as to the terms, or proper construction, of a video will, with a consequential, heightened risk of litigation following the death of the will-maker. On that account, a casual approach to recording testamentary intentions in a video will is not recommended. Compliance with formal requirements for the making of a will (presently found principally in section 6 of the Succession Act) may involve unwanted expense and inconvenience for a prospective will-maker but, if the task of compliance is not confronted in life, intended beneficiaries, and potential claimants on an estate, may be forced to bear a heavy burden after a will-maker’s death. In the modern administration of the Court’s probate jurisdiction a premium is placed upon substance over form in ascertaining the testamentary intentions of a deceased person, and in seeing that his or her beneficiaries get what is due to them. This is consistent with the governing purpose of the jurisdiction: the due and proper administration of a particular estate, having regard to any duly expressed testamentary intention of the deceased and the respective interests of parties beneficially entitled to his or her estate: In the Goods of Loveday  P 154 at 156; Bates v Messner (1967) 67 SR (NSW) 187 at 189 and 191-192; Estate Kouvakis; Lucas v Konakis  NSWSC 786 at . Nevertheless, the interests of all concerned in the administration of a deceased estate (not limited to the deceased and his or her beneficiaries, but extending also to anybody interested in an orderly succession to property) are generally best served by compliance with the formalities prescribed by section 6 for the making of a valid will. They are not intended to be onerous or to do otherwise than to facilitate the orderly administration of probate law. A person present at the time a “video will” is recorded, for the deliberate purpose of witnessing the will-maker’s statement of testamentary intentions and assisting in the recording of that statement, is “a person… who attests the execution of the will” within the meaning of section 10 of the Succession Act 2006, which governs the circumstances in which an interested witness can benefit from a disposition under a will. Section 10 applies to the making of a will admitted to probate under section 8 of the Succession Act. It is not limited in its operation to wills that comply with section 6 of the Act. section 10 appears in a part of the Succession Act (Part 2.1) that addresses the making (et cetera) of “wills” and, by virtue of section 10(1), applies to a disposition “given or made by will”. an informal will, admitted to probate under section 8 of the Succession Act, is expressed by section 8(2) to “form” the deceased person’s “will” or part thereof. the subject matter of section 10, indicated by the interrogatory heading to the section (“Can an interested witness benefit from a disposition under a will?”), is directed to all “wills”, whether compliant with section 6 or admitted to probate under section 8.
in the context of section 10(1) the expression “execution of the will” refers back to a beneficial disposition “given or made by will”. the concept of “execution” of a will is not intrinsically limited to the “signing” of a valid will (as contemplated by section 6) but is capable of application to the process by which a beneficial disposition is “given or made by will” by operation of section 8.
in the context of a video will admitted to probate under section 8 the “execution” of the will is the creation of the video (by force of statute, a “document”) purporting to state the testamentary intentions of a deceased person in a form intended to be his or her will, or part thereof, thereby carrying those intentions into effect. the concept of “attestation of the execution” (making) of a video will is, in principle, capable of application to a person present at the time the will is made, for the deliberate purpose of witnessing the will-maker’s statement of testamentary intentions and (as in the present proceedings) assisting in the recording of that statement. the beneficial purpose of section 10 (ensuring the integrity of the process of will-making and that a disposition given or made in favour of a person directly involved in that process is that of a free and capable testator) would best be served by a construction of the section (consistent with the Interpretation Act 1987, section 33) that recognises that it applies to all wills within the purview of Part 2.1, whether falling within the operation of section 6 or that of section 8.
the criteria for which section 10(3) provides are not oppressive of any person, but appear fairly to accommodate the perspectives of a will-maker, his or her beneficiaries and the public interest concern to ensure that a testamentary disposition is that of a free and capable testator. the construction to be given to section 10(3)(c), which requires the Court to be satisfied that the testator knew and approved a disposition and gave or made it freely and voluntarily, is, in substance, one which applies the general law for determining the essential validity of a will (summarised by a Young J in Woodley-Page v Symons (1987) 217 ALR 25 at 35) to a testamentary gift to an interested witness: see his Honour’s judgment in Miller v Miller; Estate Miller (2000) 50 NSWLR 81.
the practical effect of section 10, in a case to which neither section 10(3)(a) nor section 10(3)(b) applies, is to cast upon an interested witness who attests a will in which he or she is expressed to be the recipient of property an onus to allay suspicions of the Court similar to that borne by the principal beneficiary of a will prepared by the beneficiary: Miller v Miller (2000) 50 NSWLR 81 at 86 – 87, citing Barry v Butlin (1838) 2 Moo PC 480; 12 ER 1089, considered by the Court of Appeal in Tobin v Ezekiel (2012) 83 NSWLR 757 at 770 – 774.
on this construction of section 10(3)(c), by invalidating a particular provision (courtesy of section 10(2)) section 10 could operate to save the remainder of a will which might otherwise (upon an application of “the suspicious circumstances rule” grounded in Barry v Butlin) be held wholly invalid. In reaching a conclusion that section 10 governs a will admitted to probate under section 8, I am conscious that neither the report of the National Uniform Succession Laws Project Committee (in its report of December 1997 published as Miscellaneous Paper 29 of the Queensland Law Reform Commission) nor the consequential report of the NSW Law Reform Commission (LRC 85 of April 1998) adverts to the scope of what became section 10 in the context of a video will, or any other form of will, admitted to probate under section 8. I am also conscious that, in the context of a formal will compliant with section 6 of the Succession Act, the weight of opinion amongst those whose consideration of law reform proposals led to enactment of the Succession Act in NSW as part of the Uniform Laws Project looked with disfavour upon extending any form of “interested witness rule” to all witnesses to the execution of a will, not limited to attesting witnesses: NSW Law Reform Commission, LRC 85, paragraphs 3.33-3.36. In the present case, the witnesses to the making of the video will actively assisted the testatrix in the making of it. They were not mere, passive onlookers. They were directly, deliberately engaged in the making of the video will no less than are attesting witnesses to a formal “section 6” will. Any policy imperatives underpinning section 10 of the Succession Act apply with no less force to an informal “section 8” will than they do to a formal “section 6” will. Those imperatives might be thought, moreover, to apply with greater force to an informal will in the form of a video will than to other forms of informal will because of the potentially casual character of a “spoken” will captured on a video recording. Whether a person “attests the execution” of a video will within the meaning of section 10(1), read with section 8, should be tested against whether, as a question of fact, the person was present (at the time the deceased person made the statement of testamentary intentions recorded in the video) with the intention of attesting the making of the video will. Such a test, drawn from the language of sections 8 and 10 in the context of Part 2.1 of the Succession Act, is consistent with statements of principle drawn from cases dealing with legislative predecessors of section 10 in the context of earlier equivalents of section 6. See, for example, In the Will of Mary Anne Greenfield (1922) 22 SR (NSW) 478; 39 WN (NSW) 140, applying In the Goods of Thomas Brightman Sharman (1869) LR 1 PD 661 at 663; In the Will of James Ernest Elms [1964-5] NSWR 286 at 288. 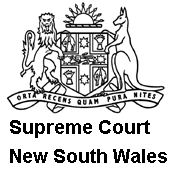 Although reversed by the Court of Appeal at  1 WLR 479, the (English) judgment of Cairns J in In the Estate of Bravda, Deceased  1 WLR 1080 at 1082H-1083A more closely accords with current NSW legislation than that of the Court of Appeal because, having stated the test as one of intention, it invites an application of that test with the starting proposition that the Court leans in favour of carrying out the intentions of the testator. The provisions of section 10(3)(c) of the Succession Act are in sympathy with such a perspective. In any event, even if section 10 were held not to apply to a will admitted to probate under section 8 the suspicious circumstances rule may, in substance, be as capable of application to an informal will, mutatis mutandis, as it is to a will compliant with the formal requirements of section 6. The rule has been held not to operate at large, but to displace presumptions of fact that may otherwise operate in favour of those propounding a will: Tobin v Ezekiel (2012) 83 NSWLR 757 at 773 and 773-774. By its very nature, an informal will (that is, a testamentary document not executed in accordance with section 6) does not, without fundamental reservations, attract a traditional “presumption” of capacity or knowledge and approval arising from “due execution”. However, a reference to a “presumption” of this character in probate discourse is more empirical than prescriptive. It is an aid to the investigation of questions of fact, and to the determination of disputed questions of fact, in a world of imperfect knowledge. It might better be understood as an inference commonly drawn from established facts: Calverley v Green (1984) 155 CLR 242 at 264. So understood, the wisdom probate “presumptions” encapsulate may be able to be harnessed in dealing with informal wills. For example, if (as in the present proceedings) an informal will is rational on its face, and the process of its creation is equally, patently rational, common experience would lead most observers to infer (in the absence of some other fact) that the will-maker was mentally competent and that he or she knew and approved of the contents of the will. The circumstance (fact) that the informal will was created at the instigation, or (as in this case) with the active involvement, of a substantial beneficiary would be likely, in common experience, to raise a suspicion about the status of the document which would, pending closer examination of all material facts, displace any inference of regularity that might otherwise commonly be drawn. The facts that are to be regarded as “material” in this context are those that bear upon a decision as to whether the particular document was the last will of a free and capable testator. In each case the essential question, in deciding whether a particular document should be admitted to probate in whole or part, is whether it was the last will of a free and capable testator: Woodley-Page v Symons (1987) 217 ALR 25 at 35. Where a video will is admitted to probate the Court will ordinarily require that a verified transcript of the will-maker’s statement be produced to the Court for incorporation in the instrument recording the Court’s grant of probate or administration. This serves the governing purpose of the probate jurisdiction, allowing for the character of a grant as an instrument of title to property (Estate Kouvakas  NSWSC 786 at -), by rendering the will available to the public and interested parties in a conventional, accessible form. In such a case, the grant should ordinarily include an express recital to the effect that the will-maker’s testamentary statement takes the form of a video recording, a transcript of which forms the grant or (as the case may be) part thereof. In a particular case of disputation about the terms, or proper construction, of a testamentary statement, the video record may remain the governing document. In the meantime, however, any person not privy to the actual video record must be able to rely with confidence on the instrument of grant. Hence the importance of an accurate transcription. Where a video will, admitted to probate, is recorded in a language other than English, the Court will ordinarily require that there be produced to the Court both a transcript of the will-maker’s statement as made and an English translation of the statement, both verified. Verification of such a translation should ordinarily be by a person (such as an official translator or solicitor) upon whose expertise and integrity the Court (and, through the Court, the community) can rely. This, like the requirement for a transcription of a video will, is more a rule of practice than a stipulation of law. In a particular case it might yield to the purposive character of the probate jurisdiction if undue inconvenience or expense would attend the provision of some form of “official” transcript. Nevertheless, a requirement for a manifestly reliable transcription expressed in English is, in principle, neither unreasonable nor oppressive but, rather, necessary in the context of contemporary Australian society where reliance is routinely placed on documentation expressed in English and a grant of probate or administration serves as an instrument of title. Ordinarily, where a grant is made on the basis that it include a transcript of a video (or audio) will (and, where necessary, an English translation of the transcript) the identity and qualifications of the person or persons who made the transcript (and, where applicable, prepared the translation) should be disclosed on the face of the grant or documentation incorporated in it. If questions arise as to the accuracy of the transcript or translation, those persons should be readily identifiable so that they can be called to account if necessary. Where an application is made to the Court under section 8 of the Succession Act for admission to probate of an informal will (particularly a testamentary statement taking the form of a video will), an orderly administration of the Court’s probate jurisdiction may require, as rules of court provide, that particular care must be taken to ensure that formal notice of the application is given to all interested parties, allowing them a reasonable opportunity to oppose the application should they be minded so to do. This is not only just. It minimises risks of error in the administration of an estate. Notification of the pendency of probate proceedings to interested parties, coupled with a reasonable opportunity for them to intervene in the proceedings, binds them to the outcome of the proceedings in accordance with the well-established principle of probate practice acknowledged in Osborne v Smith (1960) 105 CLR 153 at 158-159: Estate Kouvakas  NSWSC 786 -,  and -. Wai Fun CHAN, also known as CHAN Wai Fun (a widow, aged 85 years, born in China, but resident in Australia for 23 years) died, in Sydney, possessed of property in NSW and overseas (with an estate with an estimated value of about $930,000) on 27 June 2012, leaving: (a) a formal will dated 6 March 2012, prepared by her solicitor, expressed in the English language, endorsed by one of the attesting witnesses (also a solicitor) with a notation that he had explained the contents of the Will in the Cantonese Dialect of the Chinese language to the testatrix who stated that she understood and agreed to the contents of the Will before she signed it; (b) a DVD recording of a supplementary statement of the testatrix’s testamentary intentions recorded, in Cantonese, on 8 March 2012 in the presence of one of her children (the second plaintiff) and that child’s spouse; and (c) eight adult children scattered around the world, variously resident in NSW, Hong Kong, mainland China and the United States of America. Acutely conscious of her mortality, the testatrix was dissatisfied with the formal will made with the benefit of her solicitor because one of her children (the first plaintiff), acting against self-interest, dissuaded her from allowing that child and her sister, the second plaintiff (towards both of whom the testatrix felt especially indebted for recent support) a special legacy above and beyond the provision made for her children, generally, in the formal will. Time and circumstance conspired against a return to the office of the testatrix’s solicitor for the preparation of a codicil. With the benefit of the second plaintiff, and the second plaintiff’s spouse, the testatrix made a short, oral statement captured on a DVD recorder. She was warned that a video recording might not operate in law as a will for a want of formality. She was not deterred. She was determined to record her final testamentary intentions in a video. She expressed a strong desire to speak to her children in making her intentions known to them after her death. She could have done that in a video not intended to have legal consequences, but that was not her state of mind. She wanted to grant a legacy to each of the plaintiffs over and above any provision made for them in her formal will of two days earlier. The plaintiffs apply for a grant of probate of the formal will, together with the video will as a codicil, as the executrices named in the formal will. Their application is accompanied by a transcription of the video will in the original Chinese, and an English translation of that transcription, certified by a translator registered with NAATI (National Accreditation Authority for Translators and Interpreters Limited), a body whose accredited translators commonly provide translation services for witnesses giving evidence in the Court. Notice of the plaintiffs’ intention to apply for probate of the formal will was published in the Sydney Morning Herald on 18 July 2012. They applied for probate of the will, and the codicil, by a summons dated 14 August 2012. The will conformed to the requirements of section 6 of the Succession Act. The codicil (the video will) requires an application of section 8 of the Act. By an amended summons filed on 29 November 2013, the plaintiffs applied for a declaration (contemplated by section 10 (3)(c) of the Succession Act) that the Court is satisfied that the testatrix knew and approved of the disposition made in the codicil of particular legacies, one of which favoured the daughter who assisted in preparation of the video will, and that those legacies were given or made freely and voluntarily by the testatrix. “6 How should a will be executed? (2) The signature of the testator or of the other person signing in the presence and at the direction of the testator must be made with the intention of executing the will, but it is not essential that the signature be at the foot of the will. (3) It is not essential for a will to have an attestation clause. (4) If a testator purports to make an appointment by his or her will in the exercise of a power of appointment by will, the appointment is not valid unless the will is executed in accordance with this section. (5) If a power is conferred on a person to make an appointment by a will that is to be executed in some particular way or with some particular solemnity, the person may exercise the power by a will that is executed in accordance with this section, but is not executed in the particular way or with the particular solemnity. (6) This section does not apply to a will made by an order under section 18 (Court may authorise a will to be made, altered or revoked for a person without testamentary capacity). 8 When may the Court dispense with the requirements for execution, alteration or revocation of wills? (b) has not been executed in accordance with this Part. (c) a full or partial revocation of the deceased person’s will-if the Court is satisfied that the person intended it to be a full or partial revocation of his or her will. (b) any evidence of the testamentary intentions of the deceased person, including evidence of statements made by the deceased person. (4) Subsection (3) does not limit the matters that the Court may have regard to in making a decision under subsection (2). (5) This section applies to a document whether it came into existence within or outside the State. 10 Can an interested witness benefit from a disposition under a will? (1) This section applies if a beneficial disposition is given or made by will to a person (the ‘interested witness’ ) who attests the execution of the will. (2) The beneficial disposition is void to the extent that it concerns the interested witness or a person claiming under the interested witness. (c) the Court is satisfied that the testator knew and approved of the disposition and it was given or made freely and voluntarily by the testator. In the ordinary course, the plaintiffs’ application for probate was met with requisitions issued by the Court’s Registry. Over time, some of those requisitions were attended to, in the ordinary course, but they were not ultimately satisfied until recently, after the Court prompted a response. The plaintiffs’ application was referred to me, as Probate List Judge, by Senior Deputy Registrar Paul Studdert in one of his last acts before his recent retirement after a lifetime of working in the probate jurisdiction of the Court. Whilst sharing reservations of the NSW Law Reform Commission about the making of a formal “section 6” will by video (Report No. LRC47, Wills – Execution and Revocation, 1986, paragraphs 4.15-4.16), he recommended that the testatrix’s DVD statement be admitted to probate as an informal “section 8” will, together with a declaration under section 10(3)(c). In doing so, he informed me that, so far as he was aware, the Court had never before admitted a video will to probate, and no consideration had been given in any judgment of the Court to the relationship between sections 8 and 10 of the Succession Act. He referred the plaintiffs’ application to me because of these two novel aspects of the case. For the reasons stated in this judgment, I adopt the substance of Studdert SDR’s recommendation, including his suggestion as to the terms of a formal endorsement of the “Basis of Grant” recited in the instrument of grant. A substantial amount of the delay in processing the probate application can reasonably be attributed to the fact that the testatrix’s codicil took the form of a video will in which one of the witnesses to the video will was named as a beneficiary. The “Probate Rules” (the Supreme Court Rules 1970 NSW, Part 78) contain express provisions designed to ensure that persons affected by an application for admission of an informal testamentary document to probate are given formal notice of the application and an opportunity to consent to it or a warning that, should they fail to appear in the proceedings, they will be bound by the Court’s determination of the application. Following the Court’s adoption of a new set of Probate Rules on 21 January 2013, those provisions can now be found in the Supreme Court Rules, Part 78 Division 6 (rules 41-45). On the whole, the testatrix’s children manifested an indifference towards the plaintiffs’ application for probate, one or two even preferring to make themselves unavailable for the service of formal notice of the proceedings. To the extent that the plaintiffs may have failed to comply with any requirements of the Probate Rules for the service of notice of the proceedings on persons affected by their application, I am satisfied that the proceedings have nevertheless come to the attention of all affected persons, and that a formal order should be made dispensing with any requirement for further service of notice of the proceedings. I am satisfied that the testatrix’s formal will dated 6 March 2012 satisfies the requirements of the Succession Act, section 6. I am also satisfied that the DVD recorded on 8 March 2012 satisfies the requirements of section 8 of the Act for admission to probate as a codicil to the will: see Estate of Currie  NSWSC 1098 at , citing In the Estate of Masters (Deceased); Hill v Plummer (1994) 33 NSWLR 446 at 455E-G, in the admission of a “computer will” to probate. I am equally satisfied that, insofar as section 10 of the Act applies to the video will, a declaration should be made under section 10(3)(c). The testatrix manifestly knew and approved of the dispositions made by her in recording the DVD, and those dispositions were plainly given or made freely and voluntarily by her. The same can be said, and prudently should be said, of the formal will to which the DVD served as a codicil, with the intent that the two be read together. Finally, I am satisfied, above and beyond section 10(3)(c), that any suspicious circumstances attending the making of the video will, beneficial as it is to the plaintiffs, have been adequately and properly explained. Both the formal will and the video will should be admitted to probate. The formal will presents no difficulties. It conventionally complies with section 6. The video will does not comply with section 6 because it is neither “in writing and signed” by the testatrix nor “signed” by any attesting witness. The DVD is a “document” within the meaning of the Interpretation Act, section 21 because it is a “record of information” and, more specifically, it is a “thing” which, at least, falls within paragraph (c) of the definition of “document”. It is a thing “from which sounds, images [and] writings can be reproduced with… the aid of” a DVD player: Treacey v Edwards (2000) 49 NSWLR 739 at 745- and ; Cassie v Koumans  NSWSC 481 at ; In the Estate of Wilden (Deceased)  SASC 9 at -. In terms of section 8(1), the section applies to the DVD because it “purports to state the testamentary intentions” of the testatrix within the meaning of section 8(1)(a) and, as contemplated by section 8(1)(b), it is not a document executed in accordance with Part 2.1 of the Succession Act, which includes section 6. The DVD can be admitted to probate as a codicil to the will dated 6 March 2012 because, as contemplated by section 8(2)(b), I am satisfied that the testatrix “intended it to form an alteration to… her will”. As manifested by the English translation of the transcription of the DVD, the testatrix commenced her statement by recording the date it was made (8 March 2012) and an express claim to be “of a clear and sound mind”. That opening declaration was followed by a series of short, and apparently well-considered, disciplined statements of intent (coupled with motherly exhortations in passing) that stand neatly with the will as an alteration of the primary document. The form of the testatrix’s oral testamentary statement, reinforced by extrinsic evidence as to the circumstances and manner in which it was made and the absence of any objection from adverse interests, leaves no room for doubt about her knowledge and approval of the recorded dispositions, freely and voluntarily made. The only person visible, or audible, on the DVD is the testatrix, face to camera in the setting of a domestic kitchen. She twice glances to the side as if communicating with one or the other of the two persons (one a beneficiary) who, we know from their affidavit evidence, witnessed, and recorded, the making of her statement. She also glances down, from time to time, as if prompted by notes. However her presentation is calm, measured and at ease with the surroundings. It comfortably satisfies the requirements of the Succession Act, section 8. ORDER that the will dated 6 March 2012 (in the form of a three-page document bearing that date) and a codicil made on 8 March 2012 (in the form of a DVD recording of a statement) of Wai Fun CHAN also known as CHAN Wai Fun (who died on 27 June 2012) be admitted to probate. ORDER that probate of the will dated 6 March 2012 and the codicil made on 8 March 2012 be granted to the plaintiffs. ORDER that the proceedings be referred to the Registrar to complete the grant. ORDER that any requirement for further compliance with the Probate Rules be dispensed with. ORDER that the instrument of grant record an endorsement, as the “Basis of Grant” a recital to the following effect: “Probate of Will and Codicil. Executors appointed under the Will and Codicil. The Codicil is in the form of a video recording in the Cantonese Dialect of the Chinese Language. A transcript of the recording, and an English translation of it, are annexed”. DECLARE that the testatrix knew and approved of each disposition made in the Will as amended by the Codicil and that each disposition was given or made by her freely and voluntarily. ORDER that the costs of the plaintiffs in applying for probate are to be paid out of the estate of the testatrix on the indemnity basis.